The Itsy Bitsy Spider Crochet: Goodies from The Strumpet! 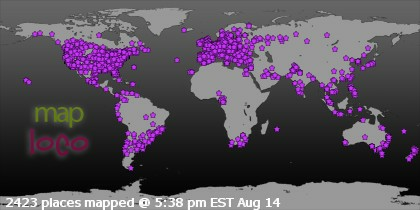 I've been meaning to post these pics for a few days now, but just haven't had the opportunity (see time flew). My swap with Becky from The Strumpet's Crumpets arrived earlier this week and I am totally in awe of her embroidery skills! 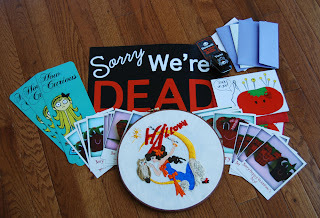 Check this out... Becky sent a whole care package of goodies, including some of her greeting cards (available on Etsy), Halloween candy, and other cute post cards! I absolutely love the sign! 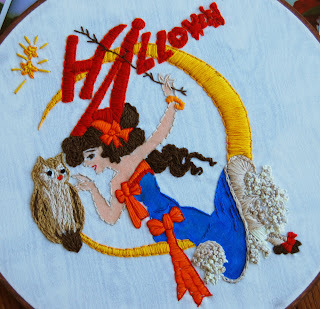 The real treasure in the package was this hand-embroidered Halloween decoration featuring a witch and an owl from an antique post card. It's gorgeous! Her petticoat is all french knots! LOL, I can't even make a pair of french knots for eyes on my cupcakes! 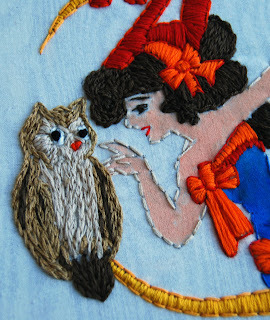 My favorite part about the embroidery is the adorable owl. Becky made the stitches in a chain so that they look like real feathers. So cool! Despite all the thought and care put into Becky's embroidery and swap goodies, my daughter's favorite part was still the packaging. So, thanks Becky from me (and Kaia too!) for putting together a treat we both enjoyed!